Once Better Living SoCal has you in your dream home, you will need to make it uniquely yours. It is no secret that personal touches add character and life to a home. Joseph Eichler intended for the spaces within his homes to be shared by the whole family and to inspire all that visit. There is no better way to feel at home instantly in your new home than by unpacking your favorite small items first. Here are 12 unique display concepts that would each look at home in your Eichler. Some are ready-to-stage, while others may be small DIY projects. Clickable links in each description will get you a closer look at each concept. 1.The Sway shelf is a perfect place to begin because it can be used in many rooms. Imagine a row of them on an open wall of a kitchen displaying glassware or a single shelf above the stool in a bathroom. 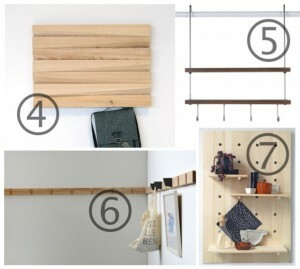 While this look could easily be recreated as a DIY project, a set of two shelves is just $69. 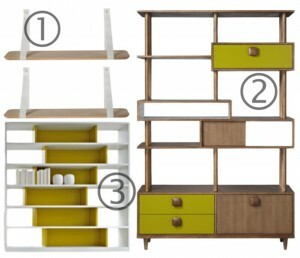 2.Orla Kiely’s Wall Units are the perfect playful punch of color and provide lots of unique display space. With sideboards and bar cabinets available to compliment them, they are a great series to consider for your Eichler. 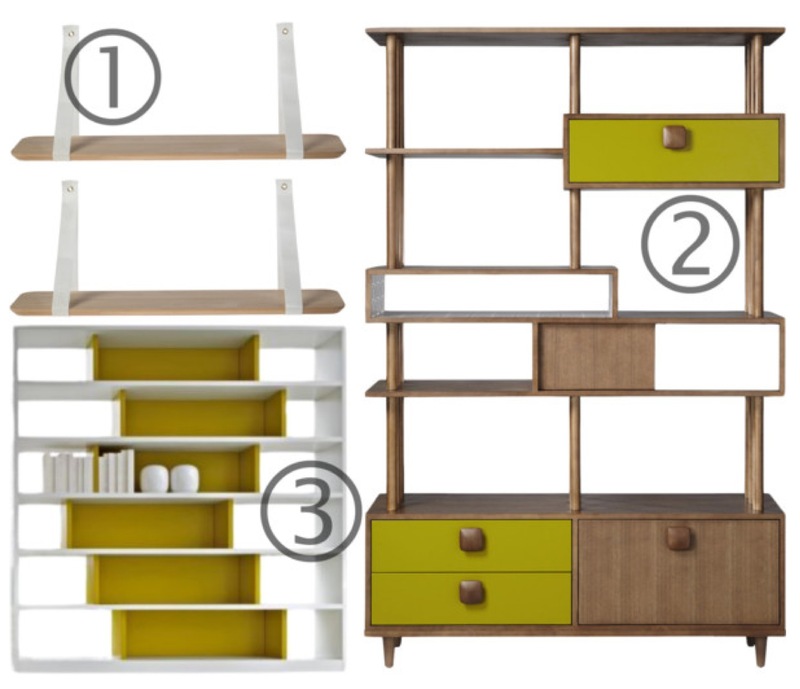 3.This 505 Shelf System by Molteni & C. shown in Mustard would house a perfect blend of books and items and could make a great room divider. 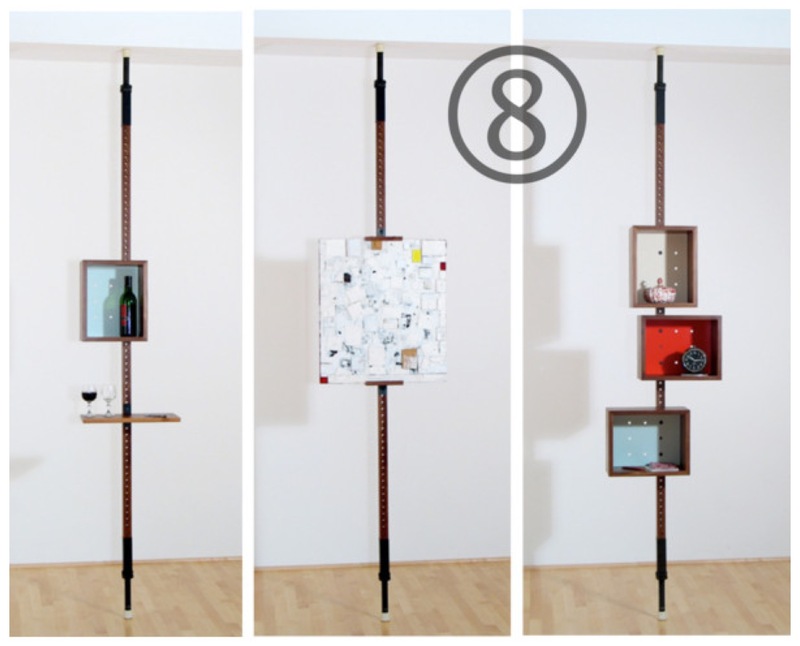 4.The REMLshelf stands alone as wall art but can be used to wedge and shelve items. Each slat is adjustable, so the unit can be used many ways. 5. 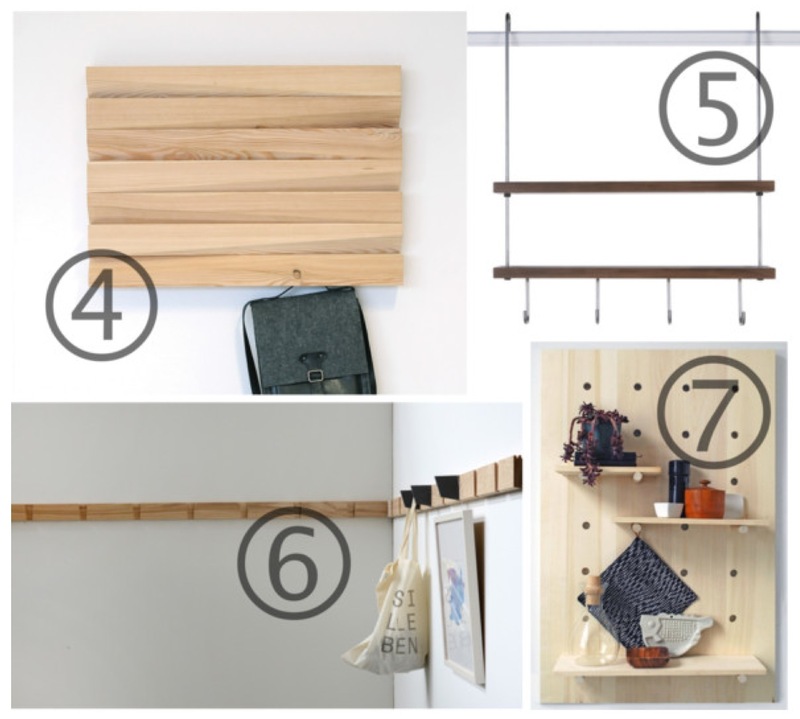 A similar installation concept to the Ordnungshaber listed above, this shelf system by Carlysle Manufacturing hangs from a picture rail installed horizontally in your room. Available in Walnut and Cherry woods, they range in price from $275-$400. 6. A modern twist on a shaker-style peg system, the Ordnungshaber storage system won first prize at the Cologne 2014 Young Designers Trade Fair. Shakers used these pegs to hang unused chairs around the room, and this system allows hanging pegs as well as shelving to be used. 7. We know a small DIY project isn’t always on the top of your list when unpacking, but consider this modern pegboard system from Apartment Therapy. They walk you through the full DIY process, from materials and measurements to installation. 8. This find might be our favorite reason to unpack your small boxes first: the PogoHome Collection of tension shelves by Julie Tolvanen. Tension rods are commonly found in Mid Century Modern furnishings, and these have a playful new twist. Don’t have room for a full bar to entertain? The small one shown on the far left can fit just about anywhere! 9. For those who collect hobbies that require equipment, consider displaying those items. The many styles of Mikili wall-mount bike racks available could make your space a lifestyle gallery. 10. At first glance these LINE racks by Apartment 8 are available in 27 matte finish and 17 high-gloss colors. A single unit could be installed near an atrium entry for quick access to a jacket or handbag, or a row of them in a master suite could display accessories. 11. 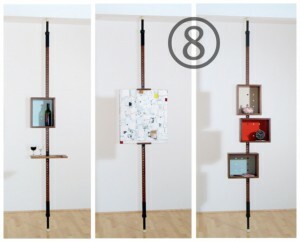 Speaking of accessories, the “Take Off Your Shoes and Jackets” rack by Ariane Marz for Ex.t. could make a pile of shoes look like an art installation in seconds. 12. With a new home comes the opportunity to add some green life to a space. Have a black thumb? Air plants are a very low-maintenance way to add green and fun to your home. There are so many ways to display your airplants. 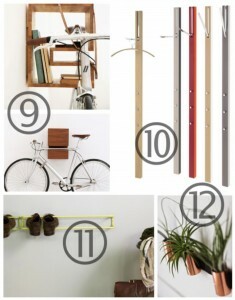 We loved these DIY Minimal Copper Pipe Airplant Holders from poppytalk.com . While packing and unpacking are not the best parts of moving, getting your own things unpacked into your new Eichler will make you feel right at home sooner. Still haven’t found your Eichler home in Southern California? Contact us today to start the conversation! Elizabeth Round brings a designer's perspective to her contributions for BetterLivingSoCal. With a background in Interior Design and experience in the Kitchen & Bath Industry, she is drawn to the Mid-Century Modern style for its bold history and inspiration for a simple but inspired life.